Up to 10% of cases of otitis media and mastoiditis: Brain abscesses are a sequela in 6–10% of otitis media and mastoiditis cases (30, 109). Major cause in emerging world: A leading cause of intracranial abscess formation in developing countries is chronic suppurative otitis media (38, 78, 86). Spread via tegmen tympani or bony labyrinth: Temporal lobe or cerebellar abscesses can occur by direct extension of infection (otitis media or mastoiditis) via the tegmen tympani, or by translabyrinthine spread. 6–8% of sinus infections cause abscesses: Brain abscesses are a sequela in 6–8% of sinusitis cases (30, 109). Frontal or temporal lobes: Frontal or temporal lobe abscesses can occur with direct spread of infection caused by paranasal sinusitis. Retrograde venous drainage and thrombophlebitis: It has been hypothesized that the anatomy of the paranasal sinuses provides a favorable environment for the intracranial extension of infection. Venous mucosal drainage occurs through the small, valveless diploic veins extending through the bony sinus wall, which communicate with the venous plexuses of the dura mater of the inner table, the periorbita for the orbital plate, and the cranial periosteum for the outer table. This connection between the extra- and intracranial venous systems may account for the transmission of infection through a retrograde thrombophlebitis (6, 57, 64, 111). 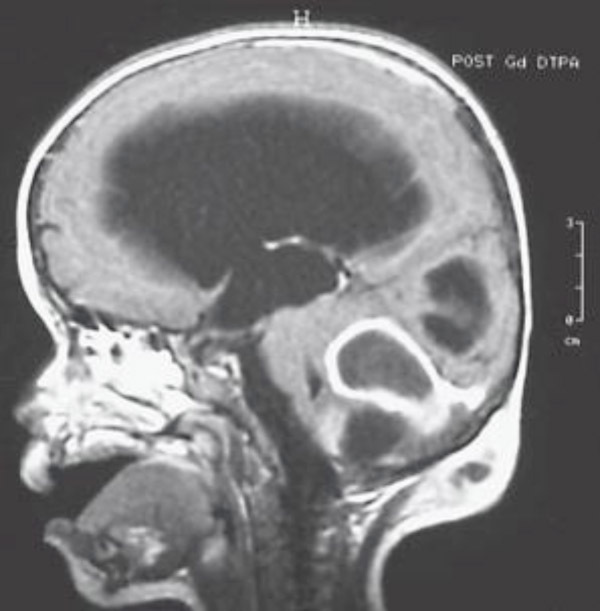 Underlying cause in 12–36% of abscesses: Meningitis is an underlying cause of intracranial abscesses in 12–36% of cases, particularly in infants and toddlers (30, 44, 103, 130). There is an alteration of the effectiveness of the blood-brain barrier in bacterial meningitis. 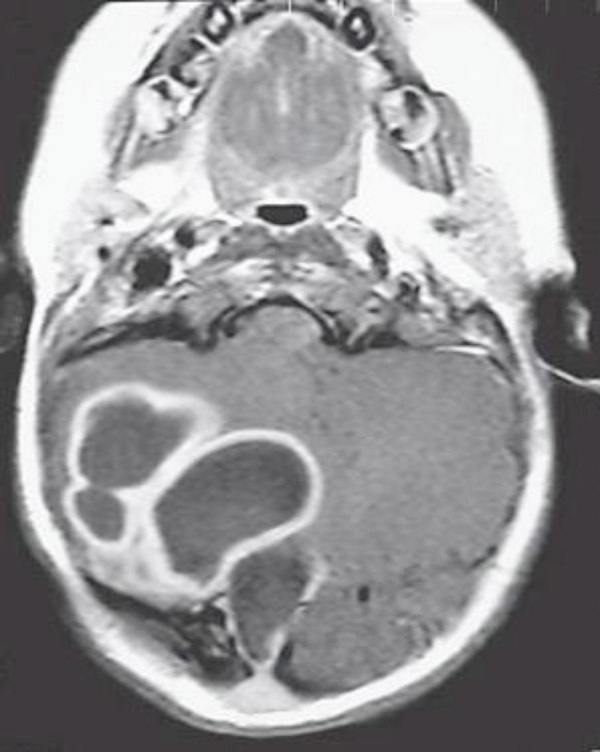 This is caused by an increased presence of tumor necrosis factor alpha, which correlates with blood-brain barrier damage (22). Infants and toddlers: Infants and toddlers are more susceptible than other age groups to brain abscesses arising as a complication of bacterial meningitis (33, 85, 125). Reports of hematogenous and local spread: There are a few reports of brain abscesses caused by a primary infection of odontogenic origin. Dissemination of the infection from the primary site may occur through contiguity or via the bloodstream (139, 140, 141, 142). Encephaloceles and dermal sinus tracts: Direct communication with the CSF through a congenital dermal sinus tract or encepahlocele can result in abscess formation (21, 96).